Summer (though woefully late this year) has finally arrived! Dangerously testing our patience with cloudy skies and drizzle well past what we already consider pitifully painful, our Juneuary is finally over. And like bears out of a long winter's hibernation, we realize that we do have neighbors; that warm sunshine and blue skies are the perfect mood-boosting elixirs; and that we need to get out in this much-appreciated warmth before it too soon wanes. 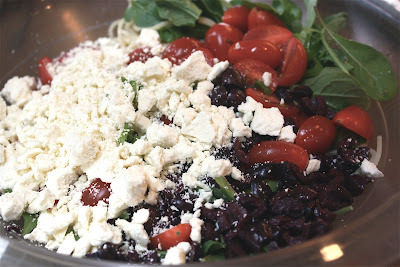 Meals that are simple, light, flavorful, healthy, and quick fit perfectly with our short, but highly welcomed, summer. With all the fresh produce available this time of year, it's pretty easy to pull together a great salad. This one is a particularly simple salad that's packed with fresh flavor and works well as a lunch or light dinner. With grilled chicken or fish, it also makes a great side dish. 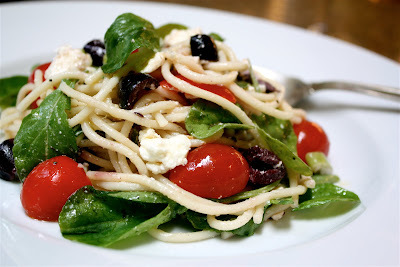 The peppery arugula in this pasta salad is a perfect partner for the meaty, fruity flavor of kalamata olives and the tangy bite of feta cheese. The combination of these fairly robust players, including sliced green onion, is well balanced by the cool freshness of the spaghetti pasta and the summer-sweet goodness of tiny grape tomatoes. 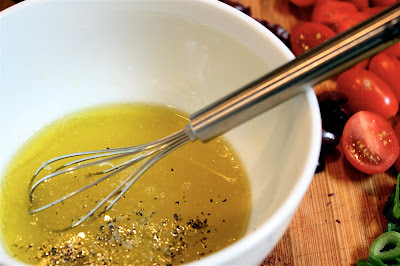 Dressed with a simple lemon vinaigrette that's sweetened with just a touch of agave nectar and some freshly squeezed orange juice, it's a quick and flavorful summer dish. 1. Bring a large pot of water, seasoned with salt, to boil. 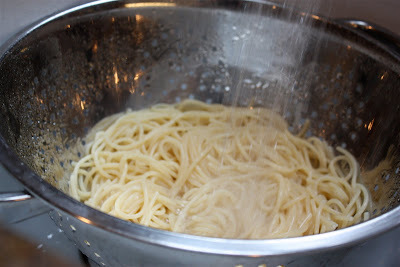 Add pasta and cook for approximately 8 to 10 minutes, until just al dente. Place a colander in sink and drain pasta, rinsing with cold water.